Vobavision is a video production business based in West Sussex working within the television and corporate sector with experience in both broadcast and commercial media. Richard Vobes, the driving force behind Vobavision, has worked with most of the major broadcasters as well as having provided services for well known corporations and many independent companies in the UK. His specialty is online media and productions for the small screen. The pursuit of storytelling is the essence of Vobavision. "I specialize in heritage, history, country and food & drink subjects, although of course open to any commissions with a strong narrative. Documentary film making is my field." So welcome to the Vobavision website. We hope that you will find your visit of interest and we look forward to hearing from you in the near future. Have a look at our video section to see if we can help you with your projects. The digital age has brought down the cost of video production to a much more realistic cost and now all business, companies and sole traders can afford a bespoke video on their website. This is great news as the moving picture really helps to sell products and demonstrate the benefit of services and these days this is easily achieved without any fuss. Vobavision is operated by an independent film maker and television producer with over twenty years in the business. 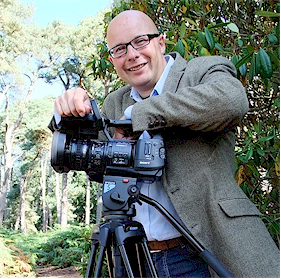 Richard Vobes has been shooting video, as well as old fashion film, since he was a teenager and brings knowledge and experience to every production. It is a competitive world and thanks to high quality of the equipment readily avaialble at lower costs than ever before there are many video production companies in the market place offering a variety of services. Its good to know that Vobavision has stood the test of time. Whether you are looking for a video solution for your website, a training video for your staff or a promotional film for an exhibition, Vobavision can help. Very often clients understandably do not comprehend the sometimes complicated video production process and may be nervous about discussing their requirements. This is where dealing with a friendly independent can be so beneficial. Instead of endless different people to talk to, you have one contact who will see you through the whole video process. Its really very simple. Simplicity is best. Vobavision doesn't go in for flashy whizzy over complicated videos. Telling the story quickly and effectively is our style. Getting the client's message over succinctly with excellent photography, clear sounds and great vision is the Vobavision way. It is very easy to walk away from a busy 'in your face' web video and wonder what it was all about. Not ideal. Feel free to take a look at the demos of recent work to get an idea of the sort productions we do and the sort of thing that might work for you. If you have any questions or requirements, please do not hestitate to get in touch.